This may or may not be the Greatest Novel Ever Written. Something Evil is taking place at a book fair. Sinister forces prepare to destroy Literature As We Know It. Only a motley group of writers can defeat this impending doom, but first they have to figure out who the protagonist is. Dealing with the ghost also might help. Cooking up 200 pounds of hash into brownies definitely won't help. Figuring out why there's a body in the men's room would be a plus. 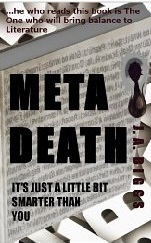 MetaDeath is NOT about a conspiracy to release an ancient evil upon an unsuspecting world, where a sisterhood of elite government assassins engage sinister, supernatural forces in an electric courtroom duel that features quirky, small-town secrets and oddball characters led by a beguiling-yet-forbidden young woman and the man-of-her-dreams who, once again the Prime Suspect, fights to clear his name with the help of their brilliant-barrister-friend Oliver Rathbone ...and alien invaders are also discovered. 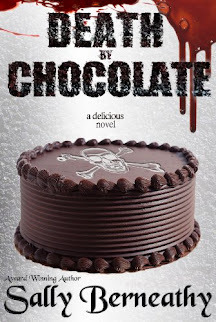 MetaDeath, the latest novel from J. Biggs, is a humorous tale packed with the supernatural and sprinkled with a bit, okay a lot, of hash-filled brownies. Enjoy the wild ride as these quirky characters unravel the mystery that could lead to the end of books as we know it and laugh your pants off along the way.